Because sick has become my natural state. 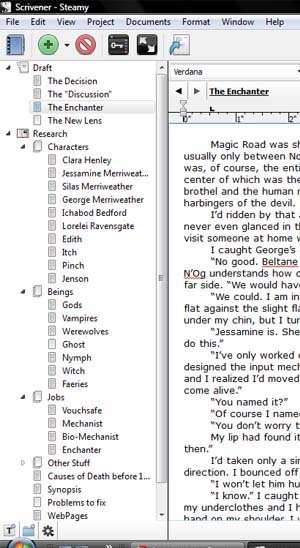 Still loving Scrivener. I did the first update yesterday, from 1.0 to 1.4. Then I wrote all of two paragraphs on the current story, but when I did a print-screen to show you all the things I love about the program, I found proof of my sickness in the many typos and sentences that make no sense. I don't know where they came from. I'm sure everything made perfect sense when I typed it. See the draft tab and the research tab? In the draft tab you can separate the story by chapter and still push them all back together when it's time for printing. In the research tab you can organize whatever you need in whichever ways make the most sense. I have tabs for each character, for each type of Being, for differences between the normal world and the world I'm writing. I don't have everything there yet written in, I'm not even sure half those creatures will make appearances in this story, possibly even this world, but I have slots for them set aside if they do. I'm not sure why, but I LOVE that! It's all so neat and organized. I've never been neat and organized. Otherwise... I've done nothing useful. I'm not sure I will until the antibiotics start to work until I can breathe regularly again. I know it doesn't really work this way, but here's hoping my two months of sickness means the rest of you get to have more healthy time this year. In fact, I'm going to pretend that it does; that these additional gratuitous weeks of sick has saved some of you from several winter illnesses you would have otherwise had. Then I can feel I've done my part for humanity this year rather than wasting all this time with minor but annoyingly incapacitating illnesses. Now go make good use of all your extra healthy times the come back and tell me how much fun you're having.